Born about 35 B.C. ; died about 7 B.C. His mother was the Hasmonean princess Mariamne. The unfortunate fate which persistently pursued the Hasmonean house overtook this prince also. As heir presumptive to the throne by right of descent on his mother's side, he was sent to Rome for his education in the year 23 B.C. He remained there in the household of Asinius Pollio until about the year 17 B.C., when Herod himself brought him and his younger brother Aristobulus, who had been with him, home to Jerusalem. Shortly afterward Alexander received in marriage Glaphyra, daughter of the Cappadocian king Archelaus. But then the clouds began to gather around him. From his mother he inherited both the personal excellences and the failings of the Hasmonean house. His handsome presence and frank bearing made him a favorite with the people, and they fairly longed for the day when this noble scion of the house of the Maccabees should mount the throne instead of the usurper and half-Jew Herod. But, on the other hand, a certain degree of vanity and a spirit of vindictiveness, which marked him no less than his prepossessing qualities, rendered him extremely unpopular with the partizans of Herod, who had much to fear from a future King Alexander. Salome in particular incessantly warned Herod of the danger threatening him from Alexander and his brother Aristobulus. The king's evil conscience, on the one hand, convinced as he was by this time of Mariamne's innocence (see Mariamne), suggested that it was not impossible that her sons meditated revenge for her unjust execution; and on the other hand, the open antipathy expressed by them against their father combined to open the king's ear to the calumnies of Salome and her fellow-plotters. Herod's attempt to humiliate Alexander by restoring to honor Antipater, an older son by another wife, resulted disastrously. Antipater's insidious plotting and the open enmity to Herod shown by Alexander widened the breach between father and son to such an extent that in the year 12 B.C. Herod felt himself constrained to bring charges against his sons before Augustus. A reconciliation was brought about, but it was of short duration; and shortly afterward (about 10 B.C.) Alexander was thrown into prison upon the evidence of a tortured witness who accused him of planning the murder of Herod. Intercepted letters were produced which only too fully revealed Alexander's bitterness against his father. In vain did Archelaus, Alexander's father-in-law, endeavor to bring about better relations between them; the reconciliation was again but a brief one, although effected with great cleverness, so that once more the intrigues of Antipater and Salome succeeded in securing the incarceration of Alexander and Aristobulus (about 8 B.C.). Herod lodged formal complaint of high treason against them with Augustus, who put the matter into Herod's own hands, with the advice to appoint a court of inquiry to consist of Roman officials and his own friends. Such a court of hirelings and favorites was naturally unanimous for conviction. 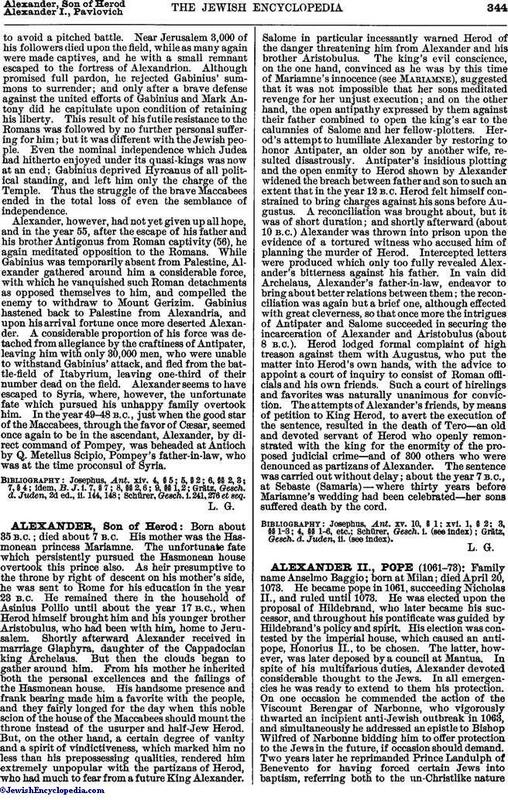 The attempts of Alexander's friends, by means of petition to King Herod, to avert the execution of the sentence, resulted in the death of Tero—an old and devoted servant of Herod who openly remonstrated with the king for the enormity of the proposed judicial crime—and of 300 others who were denounced as partizans of Alexander. The sentence was carried out without delay; about the year 7 B.C., at Sebaste (Samaria)—where thirty years before Mariamne's wedding had been celebrated—her sons suffered death by the cord. Grätz, Gesch. d. Juden, ii. (see index).